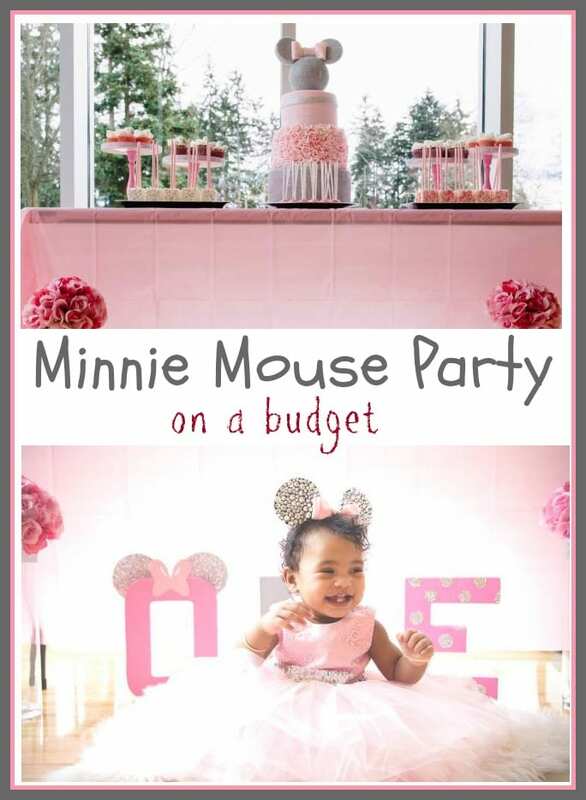 A Minnie Mouse birthday party is a hit for all ages, and we have some great tips on how you can put together your own DIY Minnie party on a budget. If you have a princess, or Disney fan in the house, this party is sure to be a hit for her, as well as all of your guests. We will show you how to save on everything from Minnie decor, to food and entertainment. If you like themed parties, this Minnie one is adorable as well as fairly easy (we have some short cuts for you to use too). Every star of a Minnie Party wants to play the part of a princess. 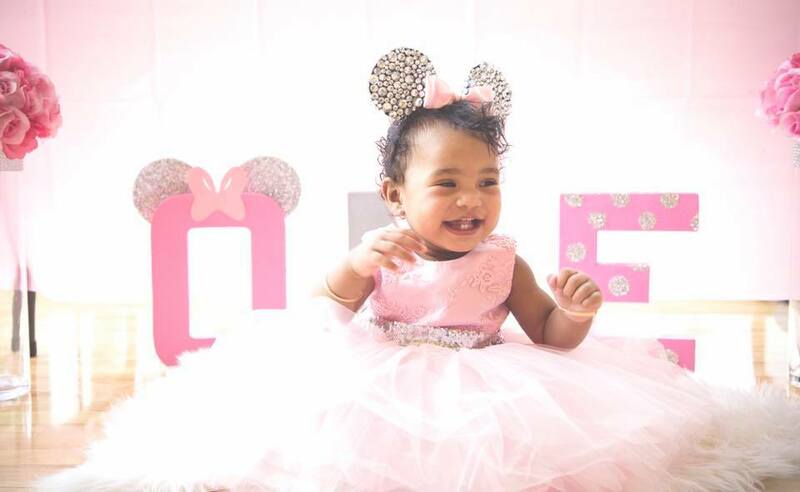 This sweet little princess Minnie was dressed in a tulle dress, and we created her own blinged up minnie ears to go with it. We really like the idea of buying a dress that the party girl can use for other occasions too (so not a straight costume dress). This sweet Minnie Dress could be a great fit. 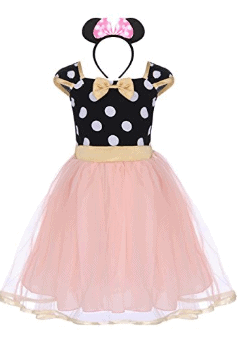 Or this polka dot minnie style dress is adorable too. If you want something a little more themed, Amazon has a number of Minnie Mouse outfits here too. 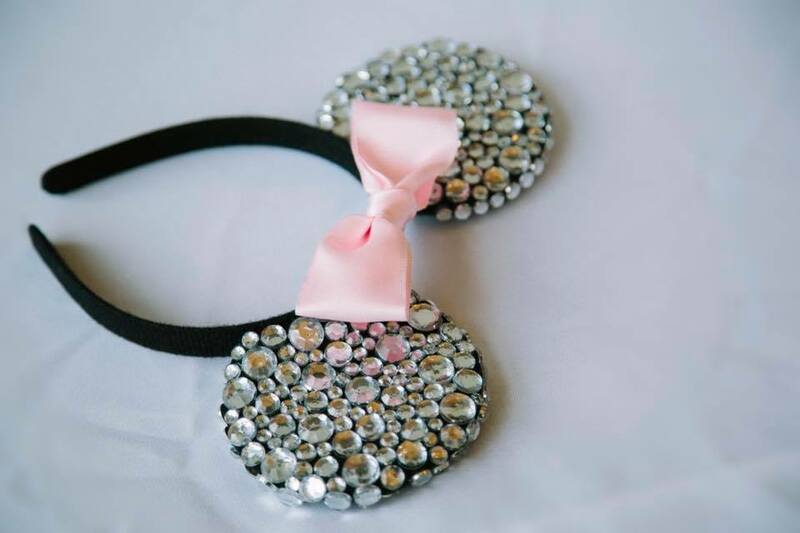 To make the princess her own special set of blinged out Minnie ears we simply added faux gems to the same set of ears we got for party favors for the rest of the guests. Add sparkly bows to any shoes your child already has to make special Minnie Mouse shoes for her outfit. Hot glue them on, and you should be able to take them off afterwards so you can continue to use the shoes for regular wear. Make a bow out of ribbon and add some silver glitter to it, and the party girl will love her new Minnie shoes. 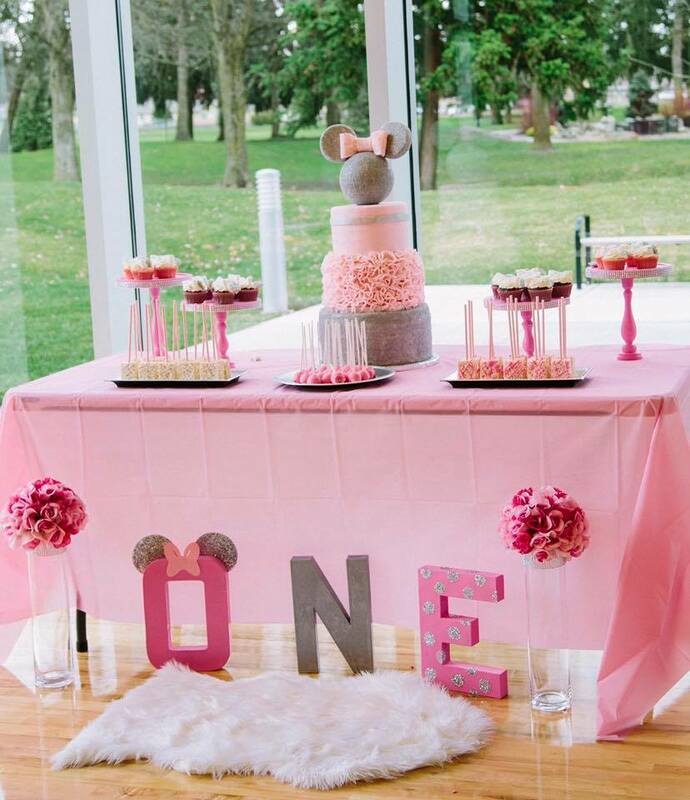 For our Minnie party, we used a pink, grey and white theme. We were going for Minnie Glam. The rose balls you see above where made out of dollar store flowers hot glued onto foam balls placed over glass vases and we put out a white fur rug bought at Tj Maxx for just over $10 so the birthday girl could really feel like a princess sitting on that. Paper Mache Numbers (or you could do your child’s name in letters too). We found the cardboard paper mache letters at our local Walmart for $3.83 ea for the 8 inch. We used the 16 inch ones in the image above, but depending on the area you are decorating, you can choose your size. Here are lots of paper mache letter options (you can get the numbers too) on Amazon as well. Once we had our numbers, we painted them with acrylic paint that you buy for .50 cents a bottle at Walmart. We chose two different colors that went with our party colors (pink and grey). The bow was hand drawn on pink card stock and hot glued it on but you could also print a Minnie bow from the internet and cut that out. The silver ears were just two circles cut out of silver glitter cardstock hot glued to the back of the O. We used a sponge dippler to make the glitter polka dots on the E by dipping the sponge in glue and dabbing it where we wanted the dots then poured glitter over it. 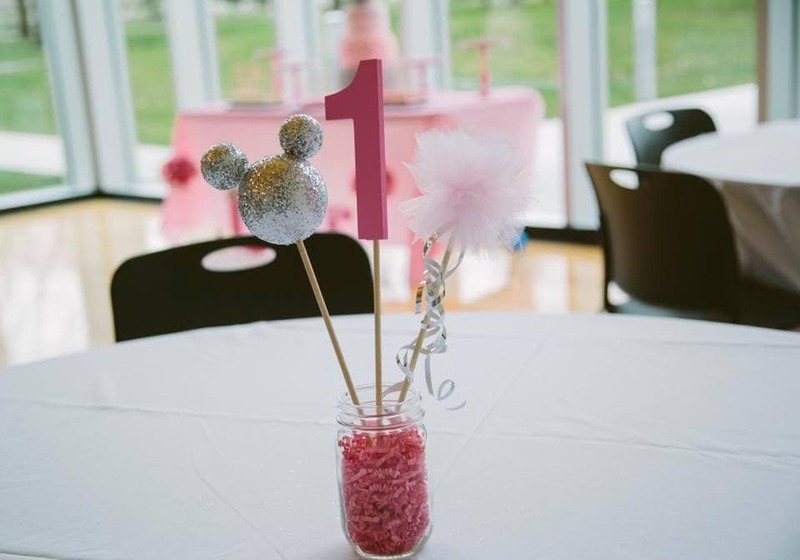 These table center pieces were made with foam balls hot glued together to form the shape of Minnie’s head then covered with glue then glitter, a wooden number 1 painted pink, and tulle pom pom balls all hot glued onto dowels and placed in a mason jar filled with shredded pink paper from the dollar store. A few more ideas on simple decor. Rather then buy pricey balloons, head to your Dollar store and grab a silver number balloon, and a Minnie balloon. You could put a bouquet together for the table for just a few dollars. Spray paint thrift or Dollar store frames in the color of your party. You can print out signs to put in them, or just place them around the room for fun decor. Wrap empty boxes in the colors of your party, and stack on the table. 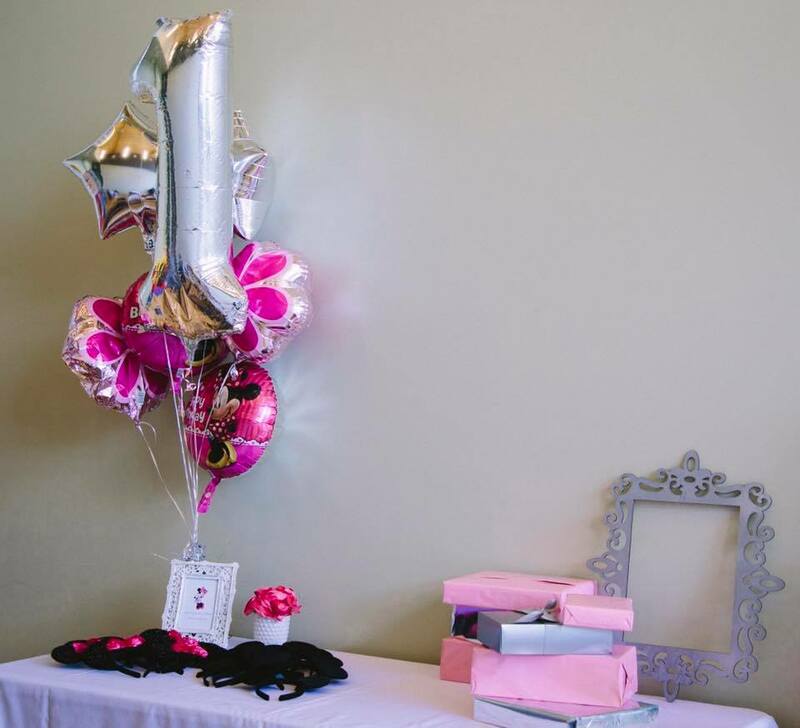 If your party is for a little one she will love to play with the boxes too. You can order some on Amazon too, if you do not want to make your own. 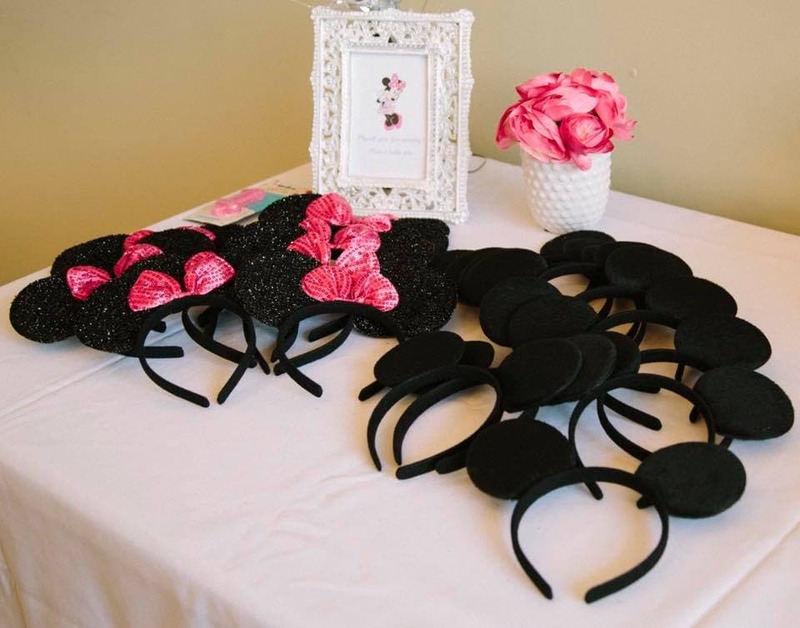 We have more Minnie themed ideas in the resource section below, but the Minnie Mouse ears were a hit at our party! 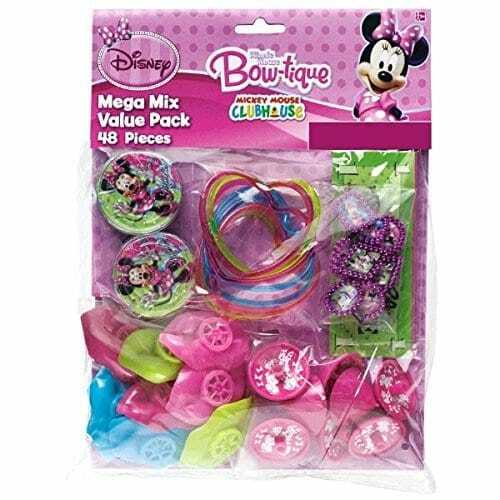 You can also check your local Dollar store for the mini bubble bottles in a Minnie theme, or Party City is another good spot to find affordable themed party favors (they have a section with items starting as low as $.25 each!). We kept our food costs down by offering a dessert table. By focusing on just putting a few items out for guests, you can provide delicious food at a lower cost. You could use the same idea doing a snack table instead of a dessert table, or a fruit table for example. Of course the centerpiece was the Minnie Mouse cake. There are a couple of simple ideas you can use to make a cute Minnie Mouse birthday cake yourself, if you do not want to pay for one. 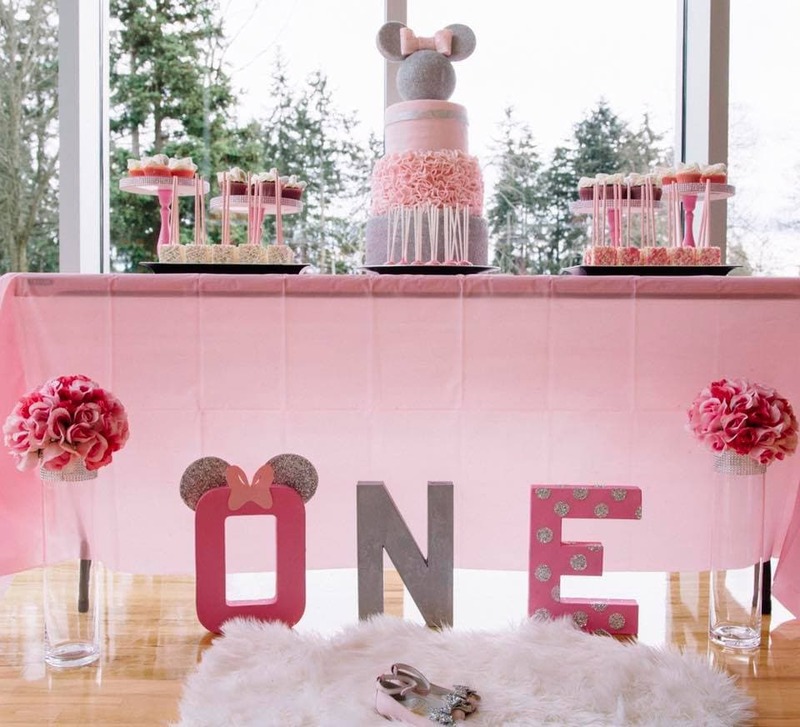 One idea is to make one layer pink, and a smaller layer grey, and then top it off with the same minnie center piece that we discuss above, made out of styrofoam balls. You could add toothpicks to the bottom of the styrofoam, and insert it on the top layer as a decoration. You could also purchase one of these Minnie Mouse Designer Prints Edible Cake Image sets, and add it to your homemade cake. If you are a bit more talented with baking, you could get mickey mouse cake pans, and add a pink bow to it when decorating. 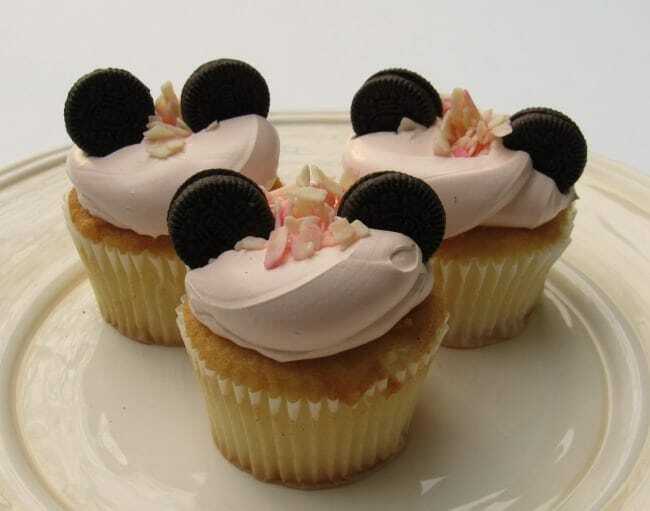 If you do not want to deal with a cake, you could bake up some simple Minnie Mouse Cupcakes by adding mini oreo cookies as ears to pink or red cupcakes to simulate minnies ears! You can also get the pearl looking or other candies to add in. I cheated with the batch above. I picked up some pink cupcakes at my local grocery store and added the mini oreo cookies to the top, and had minnie mouse cupcakes ready to serve in just a few minutes! Other simple ideas include using these Minnie Cupcake Rings to your homeade cupcakes. You can grab a pink cupcake tiered holder or these Minnie Mouse Cupcake baking cups. 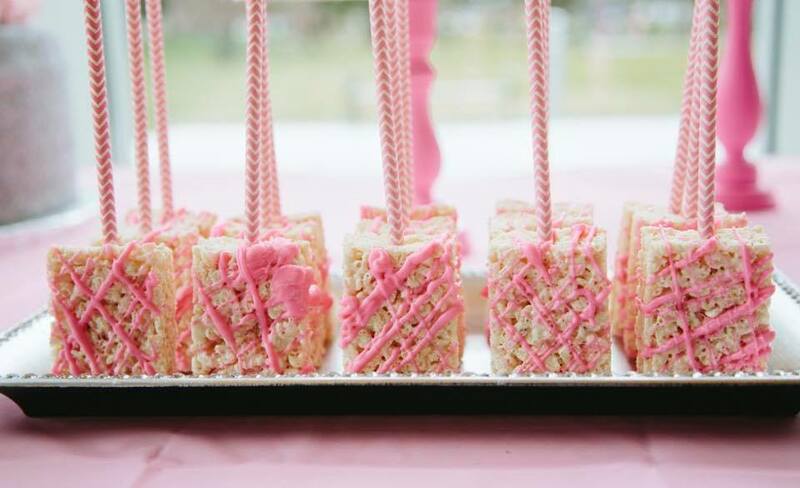 We also put together these easy Rice Krispy Treats Pops, and added pretty pink straws for handles to eat with. You can often find a set at the Dollar store. You could either make these from scratch, or cheat and buy them pre-made and drizzle with a little white chocolate to dress them up. 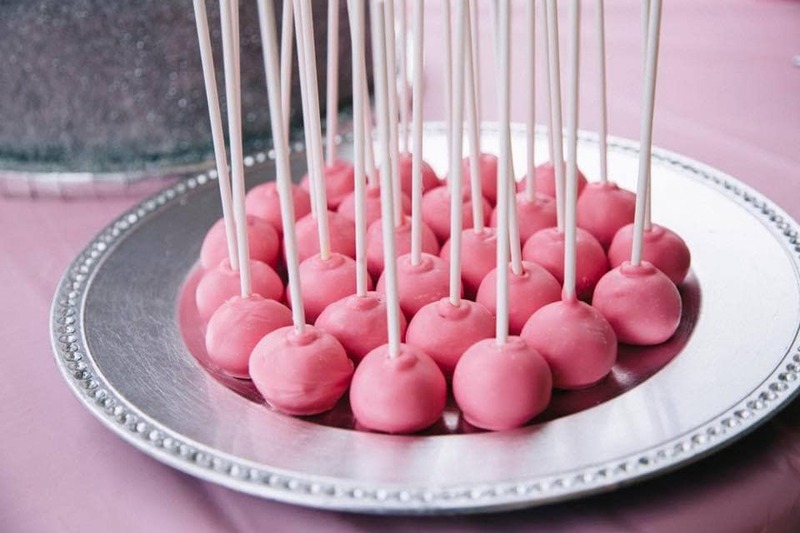 Lastly we made some pink cake pops to round out the dessert table. Here are a few ideas on how to put together some entertainment options for a Minnie party on a budget! Minnie Mouse coloring pages are available for free to print on many sites. Kids N Fun has a round up of Minnie Coloring pages here, or simply google them for more options. You could also go to the Dollar store and grab a Minnie Mouse coloring book and take out the pages and lay them across a table for kids to color at. You could even host a coloring contest, and have the kids vote on their favorite picture at the end of the party and award a prize to the winner. You could put together a Mini Mouse Photo Booth. Go get a large frame from a thrift store, and spray paint it pink to match your party decor. Suspend it from the ceiling and grab this set of Minnie Mouse photo booth props and put them in a basket nearby for guests to get their photos taken with! Disney.com offers trivia games here. You could quiz the kids on their Disney knowledge and keep score to see which team gets the most answers correct. For older kids you could have a Minnie Mouse nail tip bar. Grab a couple of colors of nail color at the Dollar store, and let them paint their nails Minnie style. 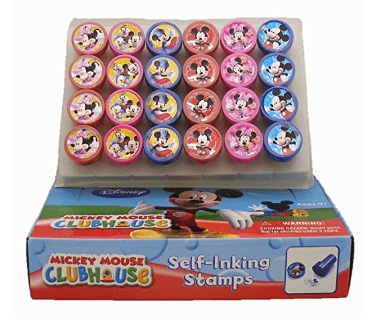 Mickey & Minnie stamp set(24 set)! 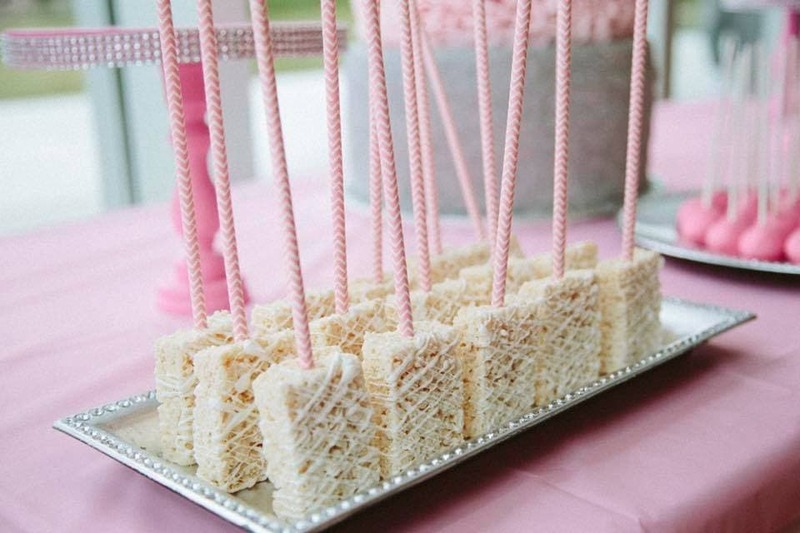 Either one of those could be fun favors for the party, or keep it simple like we did and just hand out the ears. Either way the kids are going to have a blast, and you should end up with beautiful pictures to remember a special birthday party!